What the BIAL Airport was lacking till a few months ago was a quality hotel in walking distance of the arrivals gates. With the opening of the Taj Bangalore, that is one superb thing taken care of. Tamarind, their Indian restaurant has recently opened its doors for dinner and makes for a dining destination that you can visit, just as soon as you walk out of the airport or before you check in. In fact, why use the airport as an excuse at all. A long drive can end in a wonderful dinner at this place. Placed smack in between the current airport and the upcoming new exclusive international terminal that is under construction, the exterior belies the massive interiors of the hotel. An expansive lobby, with some of the most gorgeous floral decorations is what welcomes you as you enter. An interesting and useful feature is the airport ticker board, allowing you to track your flights, if the airport is indeed your focus during the visit. A lot of natural light flows into the space making it a great place to simply catch you breath as well. The restaurants are placed to the left of the lobby. Tamarind welcomes you through wood and glass panelled doors and you step into a space that is predominantly in hues of brown with its wooden floors, and table-chairs set-ups. The tamarind leaf motif makes subtle appearances in metal embossing over the glass enclosed open kitchen, across the walls, and even on your cutlery. In fact, take a closer look at your plate when you get there. The slightly raised groove on the plate ensures that all the little katories that you have on it remain put all through your meal. Cozy seating options are the comfortable alcove seats lining one side of the dining area. Your welcome to Tamarind will be with water, just like in any other establishment. But there is a difference. Take a look at the coaster on which your water glass is placed and it will tell you that your water has been steeped with a particular spice. On the day of our visit it was cardamom. The coaster will give you an idea of its medicinal properties and its relevance to Indian cooking. The food at Tamarind is the work of Executive Chef Alok Anand. Chef believes that his food is representative of good old Indian food, the way we make it at home, with a small personal touch. Not for him the various classifications and modernization methods accorded to food today. Each of the dishes follows extensive research of meals had in homes across the country. 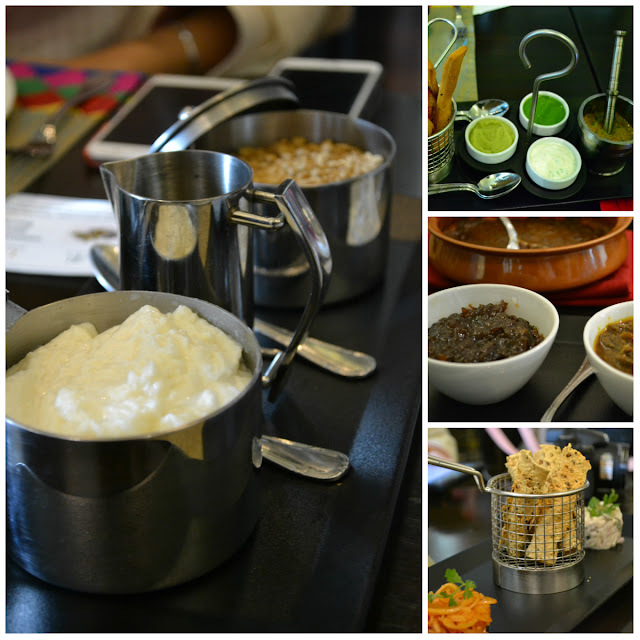 Each of the masalas used is distinct, imparting a flavour that is unique to the dish and not generic as is most times the norm. In fact, Chef Alok and his team have even sourced some of their cooking utensils from places that they have spent time in. We started with the Dahi Kalash - a little sphere courtesy some molecular gastronomy, of flavoured yogurt on spoon with a pomegranate pearl, placed on a bed of savory toasted sev. One pop into the mouth and the memories of a chilled dahi chaat come to mind. The Bakli Salad was up next - A boiled wheat salad tossed with onions, tomatoes, coriander and lemon dressing, served with crisp namkeens resting on paneer knobs. This dish comes with 4 spice mixes, each of which when mixed with the salad give it new dimension in terms of taste. The paneer acts as the neutralizer on the plate, allowing each new flavour to come forward. Up next were the soups and they were served in small portions of a little teacup each. Finally someone is listening when it comes to portions for soups. I always tend to avoid them for fear of filling up - now with portions like these (priced proportionately), there is nothing to worry about this indulgence. We had the Chane Ka Ark - a chickpea extract soup, served with a crisp roti, topped off with some mashed chickpea and butter. Chef Alok pointed out an interesting thing to note - the roti - even when dipped in the soup does not soften, but remains toasty crisp - a trick to mull over! Ghosht Pudina Yakhni was the meat based soup - a flavourful lamb stock, with meat, that is light, slightly tangy, yet easy on the tummy. Take my advice, the little lamb balls skewered and placed in the soup - eat one mid way and save one for the end. Steeped in the soup, these are a soft burst of moist flavor that make some of the simple pleasures in life, easily available. A range of starters followed - each one holding their own and making for great dishes. Usually in a tasting of this nature, one dish tends to blend into another after a while. Here, each dish makes a flavour statement of its own - much like how Chef Alok wanted it to be. Gilori Paneer Tikka - sure you must be thinking, plain old boring tandoori paneer tikka - but slice into this one and you will find that it is stuffed, rather generously with an aromatic filling which I will leave to you to dissect. Good on taste and texture, boring old is something it definitely is not. The Murgh Reshmi Seekh with a light hand on the ginger and green chillies made for a lovely kebab to bite into. It set the perfect base the Kakori kebab that was to follow in a short while. The Gucchi Malai Bahar is a every mushroom lovers tandoor delicious dream come true - stuffed with cream, fresh herbs and spices, this one is the one on the menu that warrants seconds and thirds. The Kakori Kebab didn't really wait to melt in your mouth - so soft was it that a slight touch is enough to break it down completely. Be gentle, pick it up in your spoon and let all the melting happen in your mouth. Notice on each of the plates the little pearls of green or red. Simple ways devised for the wait staff to know their meat from vegetarian dishes. Little sago pearls dipped in green or red and placed decoratively on each plate. The Sheermal Tart Mein Gilouti gets an upgrade for its sheermal base, with it being turned into a tart. A roti tart - a lovely innovation that is a play on the original, keeping its essence completely intact, yet lending a texture, taste and presentation style that is unique. Main courses were a massive flurry of dishes, each, as the chef said, standing out in terms of their tastes and the base masalas. The Qasar E Pukhtan you see below is a Paneer Roulade with a squash and nut gravy. The Phaldhari Bhurji - tandoori plantain tempered with ginger, garlic and onion was a stand out dish for me. The Kukkad Methi Saag is a soul comforting dish and one that you will instantly connect to as is the Laal Moth ki Daal. You can choose from some interesting rotis and breads like the pounded chilies and olives - Kuti Mirch Jaituni Naan. The Saufiyani Khameeri Roti is another lovely one. The Nalli E Khaas is of the kinds that you take a serving of and sit in a corner with a spoon to enjoy. The broth has a depth of flavour that underlines the reasons why the slow cooking movement bandwagon is something worth climbing onto. Tamarind offers a range of accompaniments with its dishes - what will make you happiest is perhaps the freshly churned butter with powdered jaggery. The hand pounded spring onion chutney, raw mango chutney and mint and coriander chutney served with the Kadai Masale ka Fan and Namak Para will make you reach out for more. The Khajur aur Bhune Pyaaz ki Raita - dates, caramelized onion and yogurt chutney went perfectly with biryanis that wrapped up this massive meal. The Safed Murgh ki Biryani and the Khumb Pulao are both unique in their own right and make great main course finales. Great on the taste and not to heavy on the stomach, unless of course you have gone through a meal like what I have just explained! 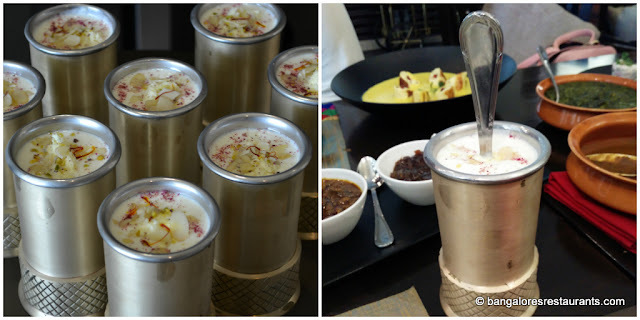 Special mention goes to the Malai Lassi - churned yogurt with clotted cream, dry fruits and a touch of saffron. So thick is this lassi that a heavy spoon stands erect in it! Desserts were the Baked Gajrilla (carrot pudding) - with a wheat base and a phirni foam in the center. 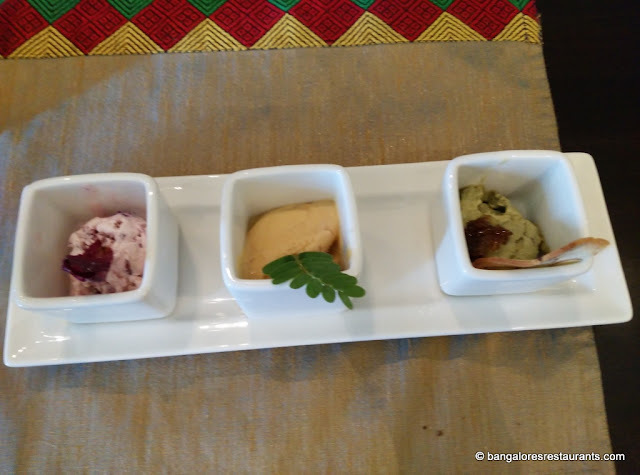 We also had a trio of ice creams - Rose, tamarind and paan flavoured. Pleasant ways to end a meal, with the rose icecream standing out to attention the most - the candied rose petals and all. The menu at Taj Tamarind is ideally designed to give you a taste of the country just before you leave it or just as you come into it. Why wait for travel, its a great place to head out if you are looking a good place post a long drive or even on your way back from Nandi Hills. Currently open for dinner, a meal for two is Rs 4000 plus taxes.